In Medias Res: What Wendell Berry's Brush Teaches Us About Capitalism, Community, and "Inevitability"
What Wendell Berry's Brush Teaches Us About Capitalism, Community, and "Inevitability"
The Art of Loading Brush: New Agrarian Writings, the latest collection of writings by Wendell Berry, isn't a perfect book, nor the perfect expression of his powerful vision of what constitutes a good life or a good community. In particular the final, essentially autobiographical stories in the book don't really work, I think, as persuasive pieces of writing. But a man of such enormous accomplishments, and of such influence on behalf of localist truths, doesn't need to hit it out of the park every time, especially not at age 83. And in any case, each of the three lengthy critical essays which form the first part of this collection are worth the price of the book alone, so you should pick it up, right now. First, a response from the Republican majority in the Kansas state legislature to the recent arguments about gun violence and America's schools. Their proposal: encourage teachers to carry guns to defend themselves and their students from mass shooters (and make sure that the identity of armed teachers is kept secret). Problem: the last time the Kansas legislature attempted this, in 2013, the insurance companies which underwrite the security of Kansas's public schools said they would not be able to justify renewing policies at existing rates if such a bill became law. The proposed solution, in 2018: simply make it illegal for those companies which insure Kansas schools from adjusting their policies as a consequence of gun ownership. Second, the demands of striking school teachers in West Virginia. In response to legitimate complaints about abysmally low pay and poor teaching conditions, and facing the prospect of a teacher walkout, the legislature offered to use state budget surpluses (when they existed) to better fund public education. The teachers, recognizing the unreliability of such funding promises, engaged in a wildcat strike--defying their own union leaders--that shut down all the public schools in the state for nearly two weeks. The state government caved, agreeing to all the teachers' demands. Initially, some in the legislature warned darkly that paying for teachers' raises would jeopardize other state programs like Medicaid; the governor, however, looking at the polls, said "there’s not a chance on this planet that’s going to be the case." What do these two ostensibly very different cases--the usually conservative cause of gun rights in the first, the usually liberal cause of public education in the second--have in common? Both present, though probably not on first glance, a challenge to what Berry calls in this essay the reigning doctrine of "inevitability," which is "an economic and technological determinism, as heartless as it is ignorant" (p. 51). It is the assumption that, of course, in the insurance marketplace, in the budgeting process--in anything related to the presumably inevitable logic of the capitalist economy, really--there is always a (presumably) "natural" way that things are going to have to work, and no amount of political grandstanding can ever make a difference. Except, of course, for those times when, as a people's awarenesses expand and their preferences become refined, it does. From its beginnings, industrialism has depended on a general willingness to ignore everything that does not serve the cheapest possible production of merchandise and , therefore, the highest possible profit....[Yet] we must acknowledge real needs that have continued through the years to be real, though unacknowledged: the need to see and respect and inescapable dependence even of our present economy, as of our lives, upon nature and the natural world, and upon the need, just as important, to see and respect our inescapable dependence upon the economies--of farming, ranching, forestry, fishing, and mining--by which the goods of nature are made serviceable to human good (p. 36). Berry's decision to hang this act of grand intellectual substitution on industrialism is of a piece with the strongly reactionary tone which these essays occasionally take. (In the collection's second essay, "Leaving the Future Behind: A Letter to a Scientific Friends," a grouchy complaint about all those who would use invoke "science" superficially to support their preferred causes, he casually wonders if the possibility of achieving "a reasonably coherent, reasonably self-sufficient and self-determining local economy" for the long term wasn't gravely harmed by the advent of "oceanic navigation" by which humans "traveled the globe"--pp. 83-84). But such contrariness aside, he has a point. For Berry, the industrial process is essentially about turning the productivity of places and persons into economic units--"We have...been turning our country into an economy as fast as possible, and we have been doing so by an unaccounted squandering of its actual, its natural and cultural, wealth" (p. 23)--and is the complete opposite of the localist and agrarian sensibility, which he presents as understanding wealth in association with "the freedom and independence that come with dependence on a parcel of land, however small, that one owns and is owned by or has at least the use of" (p. 47). That kind of wealth is not measured primarily by profit, but by "provision," a concept Berry turns to repeatedly in this essay. He writes of the "need to provide: to be living a responsible life, which is to say a responsible economic life" (p. 35). All of this comes together, when one looks at the essay as a whole: the work of farming, ranching, mining, lumbering, artisnal manufacturing, etc., are all 1) intimately dependent upon an appreciation of the natural environments within which they are conducted, as well as 2) directly related to the provisioning of human beings. Engaging in such work thus allows for a sense of fulfillment and wealth in the way an industrial economic mindset does not, since the latter turns upon price and productivity, and not upon the--in Berry's view--moral priority of responsibly providing for, or collectively participating in providing for, oneself and one's place (places being defined both naturally and in terms of human community), by patiently bringing needed goods out of the bounteous, demanding, natural world. When the industrial world--and the expanded reach, access to resources, and opportunities for monetary wealth and excess consumption which it undeniably brought to far more human beings than had ever previously ever been the case in human history--caused many to subject agriculture (as well as many other of the fundamental tasks Berry associates with the agrarian mindset) to the model of economic profit rather than community provision, the moral achievement of the agrarian economic conception was put in jeopardy. The real heart of the essay, then, comes when Berry gives us an analysis of, and mourns the loss of, one form this conception took: namely, the Burley Tobacco Growers Co-operative Association, an arrangement among tobacco growers in Berry's home state which began in 1921, took new life--and, in Berry's view, best performed its careful balancing act--under the New Deal's Federal Tobacco Program beginning in 1941, and was strongly associated with the Berry family through its entire existence until the end of the Program--and thus the end, in Berry's view, of the Association's essential role--in 2004. For a time, Berry writes, the Association "did preserve a sort of balance between industrialism and agrarianism," one which "prevented their inherent difference and opposition from becoming absolute" (p. 47). How does Berry think the Association managed this feat? You might say they did it by recognizing one inevitability, and democratically working out a way to incorporate it into a system of provision, rather than allowing it to be co-opted by another, more harmful inevitability. The traditional home economies of subsistence, while they lasted, gave farmers...hope of surviving hard times. This was true especially when the chief energy source was the sun, and the dependence on purchased supplies was minimal. As farming became less and less subsistent and more and more commercial, it was exposed ever more nakedly to the vagaries and predation of an economy fundamentally alien to it. When farming is large in scale, is highly specialized, and all needs and supplies are purchased, the farmer's exposure to "the economy" is total (pp. 40-41). But industrial capitalism, for good and for ill, had by the early decades of the 20th century utterly transformed the responsible agrarian economies of America's past, making markets abstract and global. So how to deal with already constant, and now technologically-increased and market-intensified, push towards overproduction? Not through simply subsidizing farmers in their overproducing practices (according to Berry, his father referred to "direct subsidy payments" as an "abominable form of regimentation"--p. 45). On the contrary, rather than "allowing" farmers to lock themselves into a rat-race of subsidized overproductivity, the independence of the farmer would be achieved through carefully calculated, democratically ratified, and strictly imposed limits. As Berry thoughtfully, and movingly, describes the Association's careful work, each year every participating farm was allotted, on the basis of their past history of production, a certain acreage they would be allowed to farm. On that limited acreage, tobacco would be produced that would be sold at agreed upon price--"fair prices, fairly determined...with minimal help from the government." The point was not to subsidize farmers without concern for the consequences of their work, but rather to make use of their work in a controlled way, so as to achieve real "parity," which Berry describes as the overall goal of the program. With all (or nearly all) tobacco farmers participating, the Association could obliged buyers to "bid a penny a pound above the support price"; when such buyers, or enough such buyers, could not be found, government assistance would take the form of a loan to the farmer, to cover their losses on that particular crop, which the Federal Tobacco Program would take, and which would be bought and stored by the Association, to be resold later and which, in the meantime, would affect the calculations for allotted acreage for the coming year. And so the program continued for decades--it made no one rich, but it maintained a way of life, even enabled that life to flourish. In 1940, over a third for the farmers in the Association were tenant farmers; by 1970, so many had become farm owners, thus solidifying their place in their communities, that tenant farming described less than 10 percent of participants (pp. 44-46). So what happened? Well, many things, not the least of which was the growing social and medical consensus against tobacco use in the America (which Berry himself agrees with; while he defends the benefits which the controlled management of the crop brought to the world he grew up and developed his agrarian convictions within, he makes no defense of the crop itself). But perhaps more important was the individualizing temptation of industrialism. When "industrializing members" pushed the Association in 1971 to permit "the lease and transfer of production quotas away from the farms to which they had been assigned," this allowed for the "accumulation of allotments...into very large acreages dependent more upon extensive technology and migrant labor," and thus ultimately a "reduced agrariansim" (pp. 47-48). In other words, the siren song of growth--of profit! And why shouldn't people be free to seek profits, to choose to maximize their holdings, minimize their costs, and grow their position, both economically and otherwise? Who is to say that some of these farmers might have tired, as the years went by, of the rewarding but limited and labor-intensive world of work that they'd been guaranteed a place in, and wanted to buy their way out? Or perhaps, more simply, they had a large family, or children with diverse interests, and they believed they needed greater incomes--rather than mere "parity" with their neighbors--to satisfy their needs and hopes? That's all part of the American dream of freedom, isn't it? Berry, predictably, is unconvinced. "To limit production as a way of assuring an equitable return to producers is assuredly and abridgement of freedom. But freedom for what?" (p. 41). The tobacco farmers of Kentucky and elsewhere, close to a century ago, realized (as did many thousands of other late 19th-century and early 20th-century populists, socialists, and radical reformers) that their agrarian way of life required resisting the supposed "inevitability" of the industrial economy, and developing a plan which stipulated different rules, different priorities, and different ends. Those ends may have been based on a deeper, more natural "inevitability"--but still, in so articulating them, and enforcing them, they presumed some real independence on the part of those farmers, sufficient to choose to support a way of life that they agreed among themselves to be valuable and virtuous. No, they couldn't guarantee themselves that they could maintain that way of life and at the same time enjoy the profitable "freedom" promised by the industrial economy (though such results would only come to those farmers which survived long enough to buy out all their fellows, of course). But they could choose to value their community, their culture, and accept the costs of doing so--and even, as human creativity demonstrates, distribute those costs fairly, and allow for some genuine flourishing along the way. There is much in this essay I haven't touched upon. (The way Berry connects all of the above to a contempt for rural people, and the combined decision of American business and America's government to get rid of as many farmers as possible, in the name of efficiency, is worth pondering--and his anger at politicians both Republican and Democratic is pleasantly splenetic.) But it's warning about the false, paralyzing inevitability of industrialism and the global economy is, I think, vital. Because, you know, you can actually fully fund public education without cutting social programs, if the community democratically decides to so--it just has to accept that it will require that new taxes be levied. And you can find a way to allow guns in the public schools if the community really prefers that--it just has to accept that additional insurance costs, to avoid unfairness, be borne by the people as a whole (which, again, will probably mean more taxes). As Berry documents at length, it simply isn't true what President Bill Clinton claimed, that "the increasing productivity of agriculture" made inevitable "the shrinking of the farm sector" (pp. 49-50). The success--for several decades, anyway--of the Burley Tobacco Growers Co-operative Association proves that. No, that was a choice--one that followed the assumptions made by thousands of individuals, to be sure, but also assumptions which were enabled by powerful interests, interests which found the agrarian ideal useless and irrelevant in an industrial age. In the end, Berry's mournful story teaches us that it is not utopian, not ridiculous, to insist upon a different economy than a profit-driven capitalism, a different community than one separated by an industrially determined notion of individual freedom from a sustainable and local engagement with the land. It will take time to do, it will be complicated, it will probably not last forever, it will not satisfy everyone, and in the meantime it will have costs. But to take those caveats as proof that a thing cannot be done, that the economic and technological logic of growth is simply and always inevitable is to blind oneself a deeper set of possibilities: the possibility of taking collective responsibility for one's place, emphasizing provision over profit, prioritizing public goods and public safety over corporate balance-sheets, and working out, one bit at a time, in Berry's words, "a harmonious balance among a diversity of interests." When it is done right, he concludes, for however long it lasts, "it is a grand masterpiece to behold" (p. 56). I'll probably wind up with several comments because I hardly know where to begin. My basic reaction is to echo Luke Skywalker: "Impressive. Every idea in Berry's worldview is wrong." Not factually wrong, though there are probably plenty of problems there that I could cite if I knew the details better, but morally wrong. I guess I'd start with wanting to know what the black people of the region thought of the Burley Tobacco Growers Association. Because before there was cotton there was tobacco, and when colonial planters ran out of indentured servants, they started bringing in slaves. I'll turn the mic over briefly to A. Hamilton, "A civics lesson from a slaver? Hey neighbor, your debts are paid 'cause you don't pay for labor ... 'We plant seeds in the South. We create.' Yeah keep ranting, we know who's really doing the planting." And the year of the Association's foundation, 1921, is very close to the post-Reconstruction nadir of status and legal protection for black Americans. So what Berry's valorizing is a "way of life" (and it's telling that this exact phrase was and is used by defenders of the peculiar institution and its cultural legacies) that built slavery in the United States and was sustained by slavery for many years. If I knew more about the details of sharecropping, I could back up my very strong suspicion, which is that there were many tobacco sharecroppers and that their conditions were only marginally improved from slave days. And when the Association was founded, people who had been born slaves were probably still around; the past wasn't even past. He's selling a fairy story of equality and moderation that is, in all likelihood, based on a history of chattel slavery and a near-present of race-based caste, in which he and his family were perched at the top of the heap. No thanks. I hasten to add that my spleen is directed at Berry and his view of the way things ought to be, not at you. Part of my reason for writing down my reactions is to figure out just why I hate this vision so viscerally, because neither word is an exaggeration. Thanks for sharing your spleen, Doug! 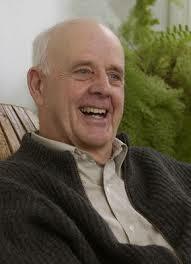 Believe me, Wendell Berry has that affect on a lot of people. I'd start with wanting to know what the black people of the region thought of the Burley Tobacco Growers Association. My guess, if you mean that comment literally and you're genuinely wondering what the black sharecroppers of the tobacco regions of Kentucky and elsewhere though about the Burley Tobacco Growers Co-operative Association, is that the answer would be "nothing." As you note, 1921 was pretty close to the high-water mark of the reign of lynching and Jim Crow terror in the American South; I'd be astonished to learn that black farmers were allowed to join. I strongly suspect that changed over time, if not by the 1940s then probably (hopefully) during the civil rights movement; given the significant decline of tenant farmers in the program's history and the concurrent rise in membership of farmers that owned their own property, and given that farm tenancy far more common, percentage-wise, among African-American farmers than it was among whites, it seems reasonable to assume that at least some of the members who reported that change were black. But I don't really know; maybe it was a racist organization through and through, and perhaps even remains so today (unlikely, but possible). Given Berry's own self-flagellating examination and condemnation of the racism which characterized the world he loves (see his book-length essay The Hidden Wound, for example), it also seems reasonable to me that he and his family and siblings wouldn't have devoted so much time to an unreconstructed racist outfit. But again, I don't really know. So what Berry's valorizing is a "way of life" (and it's telling that this exact phrase was and is used by defenders of the peculiar institution and its cultural legacies) that built slavery in the United States and was sustained by slavery for many years. In the meantime, any comments on Berry's substantive points, regarding the virtue of organizing local economies so as to collectively enable distinct ways of life to survive the culture-wrecking ravages of industrial capitalism, despite the inevitable (there's that word again!) acquisitive inclinations of community members? Probably not, because to a first approximation I don't think that's a project worth pursuing. When I hear "collectively enable distinct ways of life" I hear conformism and coercion, and lots of it, and I get far, far away. I was an outlier where I grew up, am now a foreigner, and am by nature and inclination a bit of a gadfly and iconoclast. (I have, for example, been the only one to vote against a candidate or a reasonable proposal at school-level democracy simply because I don't think democratic decisions should be unanimous; I am willing to lay down a marker for dissent.) Socially enforced collectivities are not good places for people like me to live. It's possible that the concept of a "distinct way of life" is what's tripping me up. If you said (because I am not sure Berry could or would) that communities should play to their strengths and unique aspects so that a wide range of people and organizations choose to locate themselves there and have the opportunity to flourish, I think I could get on board with that. From your excerpts and descriptions, though, I don't think that is what Berry is advocating. Good zinger about the Declaration, but I think the difference is that the "we" in America's founding documents has shown that it can grow, however imperfectly, whereas Berry's vision aims for stasis, a misty world preserved in amber. And that gets to the very first note I jotted down when I realized I wouldn't be able to resist commenting (at near-Holbovian length) on this post: Who is "we"? Who is Berry talking about when he so casually tosses around the first-person plural? It's a complaint I have about essay writing in general, and when I am Editor of the Whole Entire Internet, I will require that authors think carefully about who they mean when they write "we" or "us" or "our" and that they make sure readers know who writers are talking about when they use those words. Because assumptions often lurk in those pronouns, who is included in Berry's vision of how things should be, who is excluded. I wonder who was part of the Association's careful work, and not to put too fine a point on it, I wonder how much social control was also exercised by group control of everyone's livelihoods. I wonder who got screwed because he thought a bit differently and spoke his mind too readily for others' comfort. I don't wonder whether the Association kept the local social order as it was, because what else would it have done? Cursory Googling has turned up reports of big Ku Klux Klan parades down Broad Street in the 1920s, and a Klan rally in the Henry County (Berry's home county) town of New Haven in 1970. https://www.thecouriertimes.com/common/story.php?ID=2814 Berry's account of the Association suggests even-handed division among planters who had enough and to spare. If there's not a racial aspect that put them in that position, I will eat my hat. Getting more details about the black population of Henry County requires more facility with Census data than I am likely to acquire quickly, but the newspaper article above mentions between 400 and 700 African-American families on average from 1880 to 1940. This page from the University of Kentucky http://nkaa.uky.edu/nkaa/items/show/2368 shows a slave population of roughly 3300 in an 1860 population of about 8600. So the county's population was probably about 1/4 black in the 1940s. Obviously the Association drew people from more than one county, and equally obviously that still leaves us not knowing about who was actually included in the "we" of Association membership. I hope that nobody reading these comments is missing the irony of an organization pursuing a localist vision (overlooking for the moment that it is almost certainly a vision supporting the local oligarchy) that only works because of the Federal Tobacco Program. "Major Major’s father was an outspoken champion of economy in government, provided it did not interfere with the sacred duty of government to pay farmers as much as they could get for all the alfalfa they produced that no one else wanted or for not producing any alfalfa at all." I think it produced a positive reaction in me because it's open-ended, rather than prescriptivist, because it looks forward, rather than backward. It reminds her audience that people made the present system, and they can make a better one. I strongly suggest that "Unknown" read Berry's small book on race The Hidden Wound, wherein he deals directly with some of the questions raised here. "Berry's vision aims for stasis, a misty world preserved in amber." I've been reading Berry for 20+ years, and I find that such statements usually come from people who have either not read him in any depth, or have not read him at all. Again, thanks for sharing your thoughts here. When I hear "collectively enable distinct ways of life" I hear conformism and coercion, and lots of it, and I get far, far away. I was an outlier where I grew up, am now a foreigner, and am by nature and inclination a bit of a gadfly and iconoclast. If you said (because I am not sure Berry could or would) that communities should play to their strengths and unique aspects so that a wide range of people and organizations choose to locate themselves there and have the opportunity to flourish, I think I could get on board with that. This gets us into some murky issues of sociology and philosophy, but it is my conviction, based on both observation and participation, as well as theoretical reflection, that there is no way one can seriously--as opposed to superficially--defend the "strengths and unique aspects" of a community without expressing the internal imperatives of that community in ways that are at least mildly coercive and exclusive. But digging into that would take us back to the arguments between Charles Taylor and Will Kymlicka over Quebec nearly 30 years ago, so let's drop it. Berry's vision aims for stasis, a misty world preserved in amber. Yes, absolutely; it is a conservative vision, one that is resolutely opposed to the creative destruction wrought by industrial capitalism and the political disruptions wrought by discontented searchers and acquisitive individualists. It's not liberal at all (which isn't at all, I think, the same as saying it is outright tyrannical or oppressive, but I recognize that many might validly see it that way). I wonder who was part of the Association's careful work, and not to put too fine a point on it, I wonder how much social control was also exercised by group control of everyone's livelihoods. I wonder who got screwed because he thought a bit differently and spoke his mind too readily for others' comfort. My guess, once again, is that "social control" is a much-too-far reach, given that the realities of American capitalism and 20th-century American life. But it is absolutely the case that probably multiple members of the organization felt economically hemmed in and constrained by the balanced guarantees provided through their participation; why else would, as Berry acknowledges in the essay and I mentioned in the original post, there have been the push to allow members the freedom to trade or lease out their allotments, thus ultimately disrupting the controls upon which the price supports depended? Who knows how many bitter farmers there might have been, pissed off that the golden handcuffs they accepted in joining the Co-op prevented them from making enough money to build another barn? The change was made in 1971; maybe the pressure had been building for 30 years, ever since the New Deal money started to flow. Cursory Googling has turned up reports....I don't see that Berry does anything more than handwave at that question. Good information, though I'm sure it adds anything to assertions of yours that I've already granted. Did Berry mention the racial aspects of his preferred agrarian world? No, he did not--at least not in this essay; as I, and Rob G. below, mention, he has written at great, mournful length about the entrenched racism of his world and his upbringing before, in the book The Hidden Wound. But to challenge his writings on the basis of a perceived elision of the racist horrors of his home state is entirely valid, I think. By the same token, I have written quite a bit, and sympathetically, about what I see as the populist politics and possibilities of a place like Kansas, and I'm not sure if I've ever once talked about how the whole state was built on the graves of a slaughtered people and a destroyed culture. And that's on me. That's a great quote. But, as a parting shot, I would observe, allowing for the fact that you almost certainly are a far deeper and more thoughtful reader of Ursula Le Guin than myself, that if you take seriously Le Guin's most extensive effort at imagining a democratically achieved alternative to capitalism--the world Anarres from The Dispossessed--and you see in that world a complete absence of any (I think necessary from a communitarian standpoint) prescriptivism and social pressure, and complete resistance to any (again, I think necessary in the name of equality) conservation and personal submission, then frankly, you are a far more creative reader than I.
Oh my goodness is Anarres repressive. I finally read The Dispossessed this winter, and wrote about it here http://www.thefrumiousconsortium.net/2018/03/19/the-dispossessed-by-ursula-k-le-guin/ though I see that I have had the planet's name lodged in my brain all this time as Annares. I think the repression is saddest in the case of Shevek's playwright friend, but it's there in all kinds of ways. I think that Le Guin underestimated the amount of petty backstabbing that people will engage in though she shows some good examples: the scientific bureaucrat who demanded co-authorship, the people in the capital who manipulated work assignments, etc. I haven't read much Tocqueville, but I think I remember him observing that conformity in America being more pervasive than in his European experience, precisely because it was democratically based. Yes, he does, and that's the part of "a reasonably coherent, reasonably self-sufficient and self-determining local economy" that I am having trouble parsing. "I have a lovely vision of a self-sufficient local economy that provides for all members of my community. My best example of it is based on a non-food cash crop. It requires continued support indefinitely from a continent-spanning bureaucratic state. I am not a crackpot." Am I being unfair there? All righty, away to drop off a clothes donation, and see if the temp refugee housing not too far away has need of toy/game donations, since I can't get them on the phone. More anon-ish, I hope. Me: Berry's vision aims for stasis, a misty world preserved in amber. Rob G: I find that such statements usually come from people who have either not read him in any depth, or have not read him at all. Looks like some divergence among the people who have actually read Berry. Who's the "we" of either Berry's vision or of your interpretation of it? Based on the excerpts here, the kind of community under discussion does not sound to me like one that welcomes newcomers; it sounds far more likely to be one where people say "You aren't from around here, are you?" Immigrants, minorities, and more; it codes to me like a place that appears to work well for wealthy, landowning, white, male, straight, cis, able-bodied, neurotypical, and on and on down the line. It sounds like small-town oligarchy. My remarks on social control are based on listening to how unfree people have felt in bringing up harassment in the workplace. I'm thinking of the isolation that someone like Judge Frank Johnson faced in Birmingham, when he made rulings that went against that community's long-established "way of life." I'm thinking of workplaces I have known, and how reluctant people are to rock the boat. I would be surprised if planters whose livelihoods depended on allotments determined by fellow planters were any more likely to voice unorthodox opinions. Thank you for your kind words about my participation in the German school system. I was elected as class-level parents' representative one year, and that meant going to the meetings of all of the reps, and electing school-level parents' representatives who were then part of the district school governance. And so on up the line. I set down those small responsibilities the next year when my better half started commuting to Stockholm each week for work. I am a deputy rep for a different kid in a different school now. It's very minor stuff but useful, I hope, in its way. Interestingly, only one of the four reps/deputies for our class is a native speaker of German. None of us, to my knowledge, are engaged in farming, ranching, forestry, fishing, or mining and yet we somehow manage to be valuable people who contribute to our community. The chart and tables here https://data.worldbank.org/indicator/SL.AGR.EMPL.ZS show worldwide trends for the agricultural labor force from 1991 to 2017. The tendency is unmistakable, and I am sure that if we drew the time series further back the direction of the curves would be clear. It'll take a lot more than Bill Clinton's choices to explain something we see from Angola and Bulgaria through Estonia, Hungary and Mongolia to Sri Lanka, Turkey and Vietnam. These last (for tonight) couple of bits are likely to be murky on more than just sociology and philosophy. I've also pointed a friend who grew up on a farm in middle Tennessee to this thread; if she chooses to wade in, I think she will have interesting things to add. As they say in Cologne, "Jede Jeck ist anders." I found that having a very clear sense of where I was from (grew up in South Louisiana), which I absorbed without any great effort on anyone's part as far as I can tell, has helped me in the numerous different places where I have lived. But different people will have different experiences. Was the very distinct feeling that I did not have a future in Louisiana my own disposition, or a community defending its way of life? It's hard to say, but among my cohort at an academic and performing arts magnet high school, a large share went elsewhere. Of the leading graduates each year (top 10 people, top 10%, whatever) in the years that I am familiar with the departure rate was at least 75% and more likely close to 90%. That suggests it wasn't just me. The human capital lost to Louisiana as a direct result of its way of life is pretty staggering. And if localism looks at this kind of cost and says, "Fine, we don't need them anyway," I ask again who is this "we" anyway? What gives that "we" the right? I had intended to put in more: asking about how to draw the lines around a community geographically; to say that places are going to have distinct characters no matter what; to tie the apparent desire for a timeless community — whether that's Berry or RAF, I can't quite tell — with what I said here http://www.thefrumiousconsortium.net/2005/04/22/catching-up-with-greatness/ about Hesse's attempt to depict one in Under the Wheel "But looking in the other direction, Hesse’s idea of an unchanging society proves an illusion, too. Less than a hundred years before his story is set, Napoleon’s armies had marched through the area, upending the political order and much besides. The mid-century revolutions had not left this corner of Germany untouched either. The only way he can present a tableaux as enduring is to ignore the evidence all around." I wanted to ask for a way to describe self-sufficiency that isn't just juche and poverty. But it's late here, and my energy is flagging. This is a fun discussion, Doug. I don't think we're changing either of our minds at all, but I appreciate the opportunity to polish up what I think I believe. "I have a lovely vision of a self-sufficient local economy that provides for all members of my community. My best example of it is based on a non-food cash crop. It requires continued support indefinitely from a continent-spanning bureaucratic state. I am not a crackpot." Am I being unfair there? Amazingly enough, even people sympathetic to communitarianism can disagree with each other! I guess all those individualists and iconoclasts around us have taught us a thing or two. Who's the "we" of either Berry's vision or of your interpretation of it? Based on the excerpts here, the kind of community under discussion does not sound to me like one that welcomes newcomers; it sounds far more likely to be one where people say "You aren't from around here, are you?" I don't think that's at all necessarily true, but I suppose it quite easily could be. Are you making a moral argument against Berry's attributions of value to the "we" in his essay, or are you saying that his "we" is fictitious and fraudulent, or are you simply saying no one should ever define themselves as a "we" ever? On my reading you seem to slide from one position to another rather easily. it codes to me like a place that appears to work well for wealthy, landowning, white, male, straight, cis, able-bodied, neurotypical, and on and on down the line. It sounds like small-town oligarchy. Perhaps. It also sounds like Harvard. And pretty much like the leading figures of all major American political parties and Hollywood studios and the boardrooms of most Fortune 500 companies. If the simply fact of people who happen to be part of what was for a long time (and in many ways still is) the dominant racial/ethnic/sexual/religious/psychological norm in American society getting together annoys you, even if they get together for what Berry presents as egalitarian, conservationist, and anti-capitalist purposes, well, gosh, you must be annoyed a lot of the time. I was elected as class-level parents' representative one year, and that meant going to the meetings of all of the reps, and electing school-level parents' representatives who were then part of the district school governance. And so on up the line. I set down those small responsibilities the next year when my better half started commuting to Stockholm each week for work. I am a deputy rep for a different kid in a different school now. It's very minor stuff but useful, I hope, in its way. Are you kidding? It's that kind of "minor stuff" that actually makes neighborhoods livable, and makes democratic social life possible. Good for you, sir. None of us, to my knowledge, are engaged in farming, ranching, forestry, fishing, or mining and yet we somehow manage to be valuable people who contribute to our community. Did I or Berry ever say that non-farmers, non-ranchers, non-foresters, non-fishers, and non-miners were not people capable of contributing in a valuable way to their communities? Are you such a firm proponent of the liberating norms of industrial capitalism that you took all his attacks on the anti-agrarian mindset of the modern economy personally? I hope not. The human capital lost to Louisiana as a direct result of its way of life is pretty staggering. And if localism looks at this kind of cost and says, "Fine, we don't need them anyway," I ask again who is this "we" anyway? What gives that "we" the right? Interesting story about your youth in southern Louisiana. You're familiar with Rod Dreher's story, right? No, I'm not going to defend him; that will just annoy you even more than my fondness for Berry obviously does. But seriously, if you've never read The Little Way of Ruthie Leming, you really should. You'll almost certainly hate it (it's Dreher's story of the cancer diagnosis and death of his sister Ruthie, which led him, a Louisiana boy who attended an academic and performing arts magnet high school and got out, to return home; my reviews--I loved the book enough to review it a three times--are here, here, and here), but perhaps you'll hate it ways that will help you understand what it is that is speaking to people like me. That being said, it seems to me that you answered your own question. Who is the "we" in your example? The ones that didn't leave, obviously. Do they not have a "right" to understand themselves collectively, and perhaps even organize something like a Burley Tobacco Growers Co-operative Association to improve their lives? Or maybe you think they do, but they have to do it apologetically, always reminding themselves how they failed to fully respect those who chose to leave? If you didn't want to be part of that world, what is the objection to them conceiving of themselves in ways that don't make your perspective part of that conception? It reminds me of a line from one of Michael Harrington's books, where he admits that he left behind his Catholic faith entirely, and yet still doesn't like Vatican II, because he wants the mausoleum to remain exactly the way it was when he left it. Same here. It's worth exploring why Berry gives me the screaming heebie-jeebies and to spar with you a bit on those ideas. Thanks for your patience as I abuse an author you obviously like and think important. The bits that you excerpted reeked, to me, of moonlight and magnolias. The American places I know best are mid-South to Deep South (I have heard the ha-ha-only-serious joke that anything north of I-10 is Yankeeland), and so any conservative or reactionary project is going to be hearken back to, or openly advocate, a regional way of life from before the Civil Rights era. That is to say, a racial caste system in defense of a closed political and oligarchy, enforced by state violence and private terror. That past isn't past; it certainly isn't dead, although Alton Sterling is. So when I hear "Southern way of life" or "Southern agrarian way of life" (and any regionalism or localism in the South is going to have to be "Southern), that is what I hear. It wasn't farmers agreeing among themselves about a way of life that was valuable and virtuous that broke the Slave Power; it wasn't farmers agreeing among themselves that tried to break white supremacy. You and Rob G both write that Berry has wrestled with the racism (and presumably also the violence) that was inseparable from the world he values. Does he say how such a world could be rebuilt without the racism? Does he consider recompense for the people harmed by the previous order? You are very kind, but many days it seems the main product has been a very long list of Things To Do On My First Day As Kaiser. Many schools in Berlin do not have their own libraries! The school does not provide textbooks! (In the schools my kids attend, the parents' organizations have set up purchasing/re-use cooperatives, but why on earth is this even necessary? Why isn't this basic part of schooling a public function?) All teacher substitutions are done within the school, which means teachers are losing their planning hours and classes are getting cancelled all. the. time. That's crazy! And that's just really basic stuff, not the medium things like providing lunch at school in a comprehensive way, starting and finishing the school day at the same time every day (seriously, even elementary school kids can have three different starting times and three different finishing times on any given school day; multiply that by five days in the week and by however many kids in a family). Then there's big stuff like modifying tracking so it does something more than just reproduce existing social structures. I'm going to be a busy Kaiser. Did I or Berry ever say that non-farmers, non-ranchers, non-foresters, non-fishers, and non-miners were not people capable of contributing in a valuable way to their communities? Not explicitly, but it's clear from the excerpts and the essay around it that that's where the virtue is. I mean, the idea is "agrarianism" after all. It's not "teacherism," wherein the greatest virtue is in passing knowledge and experience on to future generations, and society is organized to recognize that fact and facilitate its functioning. It's not "philosophism," wherein the greatest virtue is in understanding the nature of the good life, and society is organized around that concept. It's not "scientism," wherein the greatest virtue is comprehending the workings of the natural world, and society is organized to increase that comprehension. As depicted here, there are the farmers, ranchers, foresters, fishers, miners and perhaps artisanal manufacturers who provide, and there is, well, everyone else. Who are what? Are you making a moral argument against Berry's attributions of value to the "we" in his essay, or are you saying that his "we" is fictitious and fraudulent, or are you simply saying no one should ever define themselves as a "we" ever? On my reading you seem to slide from one position to another rather easily. I can't figure out who the "we" is. If it's just the planter oligarchy deciding things for everyone else, then I would go with immoral and fraudulent. It's possible that he thinks that everyone is included, but what's happening is that it's only everyone he thinks counts that is included, in which case I would go with fictitious. For example: "[Yet] we must acknowledge real needs that have continued through the years to be real, though unacknowledged: the need to see and respect and inescapable dependence even of our present economy, as of our lives, upon nature and the natural world, and upon the need, just as important, to see and respect our inescapable dependence upon the economies--of farming, ranching, forestry, fishing, and mining..." Who the heck is the "we" in this sentence? For another example: "We have...been turning our country into an economy as fast as possible, and we have been doing so by an unaccounted squandering of its actual, its natural and cultural, wealth" Does this localist, small-scale agrarian mean to speak for all 320,000,000 Americans? If not, who is "we"? Of course collectivities and communities are real. But equally obviously, they are multiple and overlapping, very messily. That's part of why I was banging on earlier about how close Henry County is to Louisville. The kind of community Berry seems to want is always going to be embedded in a web of connections, just as it is going to be enmeshed with an actual past. The splendid isolation he seems to want to conjure sounds like juche crossed with subsistence farming. At any rate, I really do have trouble figuring out who Berry is talking about when he writes "we," and I think it's a crucial question. Who is included in his community? "Looks like some divergence among the people who have actually read Berry." I'd say that there is a distinction to be drawn between what Russell calls Berry's "conservative vision" and "a misty world preserved in amber." Just as all liberalisms don't necessarily rely on the vision of a future Golden Age, all conservatisms don't rely on the vision of some past one. In other words, there's a good bit of workable space between the two extremes of "immanentizing the eschaton" and "turning the clock back." Regarding Berry's take on individualism, his views on the subject seem to echo somewhat those of the earlier agrarian/conservative writer Richard Weaver. See, for instance, the latter's 1963 essay "Two Types of American Individualism." "The kind of community Berry seems to want is always going to be embedded in a web of connections, just as it is going to be enmeshed with an actual past." Indeed. And if you read Berry you find him saying that over and over again. His point is that while the embeddedness itself is natural and inescapable, there are various aspects of it that are not, and thus are by no means inevitable. Not all the connections need work themselves out in the same way in all times and places. Berry annoys me, your fondness for his work interests me. You and I are on the same side of a lot of things, so your fondness for a reactionary is something I think it's worthwhile to understand. Prairie populism, as I understand it, was a way for the farmers of the region to get a fair shake against the combined power of Eastern bankers and the local railroad monopolies. Sign me up! Berry's up to something else entirely, so what are you doing getting on board with him? You're familiar with Rod Dreher's story, right? I'm looking in on the three pieces you linked to. Repeating a question from above Did I or Berry ever say that non-farmers, non-ranchers, non-foresters, non-fishers, and non-miners were not people capable of contributing in a valuable way to their communities? In the second Dreher piece, you say "I'm relatively convinced that the only way all of this emphasis upon simplicity and locality and community can hold together is when you're operating within a set of assumptions which privilege rural environments, producer-based economies, and agricultural work." Does that still hold, five years later? If so, it's not that non-farmers, non-ranchers, non-foresters, non-fishers, and non-miners can't contribute, they're just second-class members of that community. Here's Dreher from your first piece, "I once asked Paw why, given that he was feeling sick that day, he was planning to go to the funeral of an old woman he didn't know well. "It's hard to know these things, much less find the wherewithal to behave this way, if you haven't lived in a place for years and come to make its stories part of yourself." I'm with Paw on this one. It isn't hard to know those things. [Dreher]'s not instinctively a content communitarian (he loves his travel and his technology much too much for that), and can't honestly wish to turn everyone into such; indeed, he makes it explicit in this book that he thinks there are seasons to every person's life, and that coming and staying both have their place. I don't have any problem with this at all. It's the Kölner again, "Jede Jeck ist anders." I really should be less of a sore winner on this topic; there's a reason that "You can't keep 'em down on the farm" is a hoary cliche. Vikings in Constantinople, Chinese pottery found in Roman Britain, all these and more testify that trying to keep everyone nailed down where they were born isn't just wrong, it's futile. This paragraph has the causality backwards, so maybe I didn't express myself well the first time around. Why have the powers-that-be organized their (and I use that possessive avisedly) community in such a way that it drives so many people away? "For the two years following the 2000 U.S. Census, no other state lost as many people to migration as Louisiana, according to new census estimates. "The estimates, from the April 2000 Census to July 2002, show 47,039 more people moved out of Louisiana than moved in. About a year before, The Advocate had published a long series on "Leaving Louisiana," detailing why people left, where they went (Houston and Atlanta were big recipients), and what they had made of their lives since leaving. It combined statistics and reporting. It closed with recommendations about what could be done to keep more people who missed Louisiana once they left but couldn't see futures for themselves there. The reports about black citizens and how many more paths were open to them elsewhere were particularly eye-opening to me, though perhaps they should not have been by then. And that was before Katrina. Nor is it just numerical; anecdatally, from my HS class Louisiana has lost a Rhodes Scholar, a Stanford undergrad/law grad who's a tech venture capitalist, a Harvard undergrad/MBA who's a health system expert, a Yale-educated gerontologist, a Berkeley-educated marine biologist, and on and on. From 2000 to 2010, Louisiana's population grew at one-seventh the rate of the United States as a whole. Maybe there isn't any larger lesson from Louisiana other than corrupt oligarchy (is there any other kind?) not being a good way to organize a polity, I dunno. I don't actually care, much, about how the mausoleum looks. I don't have any family there anymore, unless my dad decides to move back now that my stepmom has passed. I don't have many friends who are still there. I see a place that ought to be splendid and lovely. But if there's anything I've learned from observing a lot of organizations, it's that they are usually the way they are because the people with the most power within the organizations want them that way. Thanks for the best discussion this blog has hosted in years! I'd say that there is a distinction to be drawn between what Russell calls Berry's "conservative vision" and "a misty world preserved in amber"....there's a good bit of workable space between the two extremes of "immanentizing the eschaton" and "turning the clock back." Agreed. If you're interested, Doug (and I'm guessing you're not, but maybe I'm wrong? ), we could get into discussions about the various streams of conservatism, Burkean vs. agrarian, etc., and debate where Berry's thought stands among them. But yes, even without such discussion, I think it is important to recognize that sticking the label "conservative" on someone, and then insisting that it must mean anything and everything Republican (which Berry is definitely not) or racist (which I guess the jury is out regarding Berry, despite his long and thorough denials of such) which comes to mind is simply wrong. In fact, I got my agrarianism by being born into an agrarian family in an agrarian community. And so I have recognzied it and been grateful for it wherever I have found it. I found it in "I'll Take My Stand," which certainly can be associated with racism and contains evidence of it, but it would be substantially the same book if those contaminants were removed. Its "Statement of Principles," to which have given the most praise, contains nothing of racism. Moreover, my closest agrarian friends and allies, beyond my family and neighbors here at home, have belonged to the Midwest, not the South (pp. 7-8). Is Berry Jeffersonian to the degree that he actually thinks a way of life which involves an economy dependent upon regular, productive interactions with the rhythms of the natural world, rather than commercial (or, by technological extension, informational) transactions, is superior? Absolutely. Does that mean he, therefore, believes anyone who lives in non-agrarian communities and feeds themselves and their families through non-agrarian work are "second-class citizens"? I see no indication of that. Don't you believe, Doug, that your political beliefs are superior to other political beliefs? Don't you think that by getting out of Louisiana you made a better choice than those who stayed? I assume the answer is "yes" (though perhaps I'm wrong). But I also assume that you're a generous enough human being to not, therefore, assume that those who didn't leave Louisiana, and who don't vote the way you do, are evil, lesser, human beings. Please extend Berry the same generosity, then. Yes, he's defensive of his way of life; he does believe in (and--I think, at least--can make a good moral and political case for) the virtue of the forms of knowledge and work (what I called "the emphasis upon simplicity and locality and community") which his agrarian world allowed to take form, and he sees (again, I think justifiably) the accomplishments of that world being undermined by global capitalism and industrial technology and their accompanying mindsets at every turn. He's not alone in thinking that way; the literature on producerism, distributism, agrarianism, and localism--which, I would insist, all very strongly overlap with multiple historical forms of populism and socialism; if you see no similarity whatsoever between Prairie Populists trying to "get a fair shake against the combined power of Eastern bankers and the local railroad monopolies," and the Burley Tobacco Association organizing to protect farmers from price fluctuations driven by bankers and stock-market players far away, then I really did a bad job describing Berry's defense of the program--are legion, going back to Rousseau and continuing until today. Have any of those perspectives won the day? Nope, not one of them. But the inability of agrarian and communitarian and localist ideas to carry the day in the era of global liberal capitalism isn't necessarily a principled, substantive argument against them. Is it? It's not. But do we want to get into the communtarian literature here, or just stick with Berry? Patrick Deneen has made the same point about the Southern agrarians and about "Southern conservatism" in general, as have Eugene Genovese and others. Race-sensitive critics, from both left and right, mistaking a bug for a feature, have often thrown out the baby with the bathwater here. See for instance the ridiculously unsympathetic introduction to the most recent edition of I'll Take My Stand. The Tennessee college at the edge of the Cumberland Plateau that I alluded to way upthread is Sewanee (The University of the South), so it is fair to say that I was practically swimming in conservative thought and agrarianism for four years. I am sure that I read I'll Take My Stand at some point during those four years, though it has not stayed with me as much as V.O. Key's Southern Politics in State and Nation. I did take a course in Southern politics, but not in Southern literature or Southern religion, both of which were regularly offered. Sewanee is so conservative that the joke about the light bulb runs, "How many Sewanee students does it take to change a light bulb?" "Change? Change?? CHANGE?!??" It is very nearly feudal. Ok, as Ta-Nehisi Coates used to say, talk to me like I'm stupid. When has this ever existed? And if it has ever existed, when has it done so as more than the meanest form of subsistence farming? And if it did exist in that form, was it a good life for any but the tiniest sliver of people? Russell, this — "I'm relatively convinced that the only way all of this emphasis upon simplicity and locality and community can hold together is when you're operating within a set of assumptions which privilege rural environments, producer-based economies, and agricultural work." — which prompted my remark about second-class citizens, was you writing in 2013 in the second piece you linked to about Dreher. How do you propose to privilege those things? If you still think that's a good idea. But do we want to get into the communtarian literature here, or just stick with Berry? I've pretty well figured out why the excerpts from and description of Berry give me the heebie-jeebies; from my point of view, we (you, me, Rob G, anyone else who drops by and is interesting) can follow the conversation wherever time and inclination allow. But his world was built by the global capitalism and industrial technology of the period of white settlement in Kentucky. The man for whom Berry's home county was named was one of the leading proponents of the National Road, a major accomplishment of the global capitalism and industrial technology of the time. In the 1830s — about the time Berry's forbears were settling the county, if I read correctly — the National Road became the second in the US to get a macadam surface. High tech! And if the agricultural products of Henry County didn't go down the river, possibly on a newfangled steamer, they probably went up to the Road and onward to larger markets. 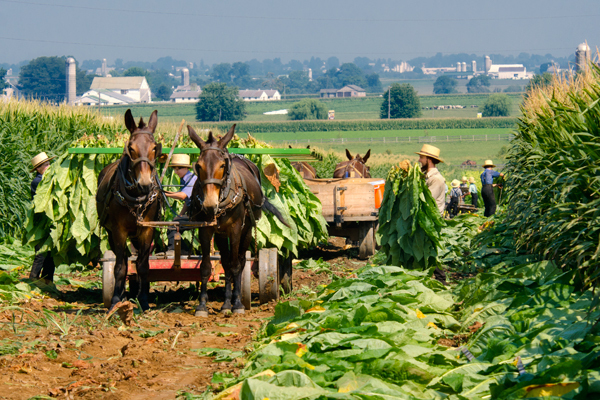 Tobacco farming in northern Kentucky was a part of global markets and technology from the beginning, would have been impossible without global markets and technology, and has been a part of global markets and technology every step of the way since, including crucial support from the modern bureaucratic state. How he imagines it could, at this late date, uncouple from global capitalism and technology is beyond me. Who now wants the mausoleum to remain unchanged? In re Prairie Populists and Kentucky tobacco planters, did the prairie farmers count on indefinite (if periodic) cash support from Washington to make their enterprises work? I honestly don't know enough about their program to say. That seems an important distinction to me. I am less in tune with whatever injustices are back in the history of prairie farmers; I know more about what kind of social relations a group of Southern planters are likely to be perpetuating, and that makes me much more skeptical of their virtue. This may also be a product of my just not knowing much about Plains history. My upbringing and education have a strong regional component, after all. Discussion of race and agrarians and Agrarians will have to wait until tomorrow at least, but there's a huge burden of the past that will take a lot of work to overcome. For example, Pigford v. Glickman led to a massive settlement over racist policies that the USDA pursued until 1996. 1996! Talk about the past not even being past. I don't know why I wasn't signed in as myself before. That's why I showed up a couple of times above as "Unknown." Wasn't paying attention. First, regarding "an economy dependent upon regular, productive interactions with the rhythms of the natural world, rather than commercial (or, by technological extension, informational) transactions"
When has this ever existed? And if it has ever existed, when has it done so as more than the meanest form of subsistence farming? And if it did exist in that form, was it a good life for any but the tiniest sliver of people? Two ways I could respond to this challenge. First response: "You're kidding, right Doug? I mean, you've met Amish before, right? Old Order Mennonites? Hutterites? Kibbutizim? The Mormon fundamentalists?" Honestly, there have been dozens, hundreds of agrarian communities, wherein tens, hundreds of thousands of people have made their lives in the context of relative and sometime near total self-sufficiency and autarky, throughout all of modern history. Were the lives of those people characterized by solely "the meanest form of subsistence farming"? Actually, not usually; a responsible economy of provision, as Berry puts it, often allowed for significant comforts, though almost never anything that we would consider luxury. Did those communities only satisfy the longings of a "the tiniest sliver of people"? Admittedly, the literature about such communities and places might suggest that. Of course, said literature is often written--to use you own wonderful examples--by the folks who didn't like it there and left: the Rhodes Scholars, the Stanford-educated tech venture capitalists, the Harvard-educated health system experts, the Yale-educated gerontologists, the Berkeley-educated marine biologists, etc. Great and admirable people, no doubt. Are their perspectives in fact fully reflective of and accurate to the feelings of contentment, accomplishment, and joy which committing oneself to a rural life might occasionally (not always, maybe not even usually, but definitely occasionally) give rise to? Maybe they are. Berry obviously doesn't think so, though--and my own observations and experiences lead me to agree with him, at least mostly. The second response would be: "Of course it has never existed solely in terms of the ideals which Berry and other agrarians see as exemplified through it. There is always a difference between the real and the ideal. Every single one of the agricultural communities I mentioned above failed in multiple ways to live up to their aims, sometime spectacularly. Of the many local, counter-cultural farmers I know (I like to take my students out on what I refer to as "local food tours"; I've been doing it for years), not one of them couldn't be hammered for hypocrisy (except, actually, they couldn't, because most of them don't bother to write about their experiences in ways that advance any literary or theoretical claims). Joe Miller, the pious Christian guys who moved his whole family here from Tennessee and started an off-the-grid tomato farm (great place, Cheney Lake Tomatoes; it's one of our favorite stops on our tours), partakes of the cash economy; most of his equipment he uses was purchased from selling his tomatoes to local restaurants. And his built-from scratch greenhouses for grow tomatoes year-around don't even use soil; he uses industrial perlite. So yeah, they are all every bit as compromised as Berry's National Road-using Kentucky ancestors were. And, that all means...what? That his argument for the value of that way of organizing life is disproven? Like, the same way the fact that no human community has yet fully lived in light of "all men are created" or "love one another" disproves any defense of those claims? Obviously not, I should think. So...maybe it means Berry is a crazy utopian, tilting a windmills, leading a potentially tyrannical cult, best ignored? Maybe probably closer to it; as you write, "How [Berry] imagines [agriculture] could, at this late date, uncouple from global capitalism and technology is beyond me." Suffice to say, we can imagine different things. I can easily imagine it. It would mean food would be more expensive, and probably a lot of us would be obliged to spend at least a little time (or a little more time) helping to grow it. Which doesn't strike me as inherently problematic; I'm insufficiently convinced of liberalism's philosophical anthropology of human beings to think that minimizing costs and labor--which, of course, is what the corporate masters of Wall Street always want to do--is in all ways a morally rewarding thing. "I'm relatively convinced that the only way all of this emphasis upon simplicity and locality and community can hold together is when you're operating within a set of assumptions which privilege rural environments, producer-based economies, and agricultural work. "....How do you propose to privilege those things? If you still think that's a good idea. I do still think it is a good idea; I think a world with more people engaged in agrarian tasks, if only as a sideline, is a better than a world with fewer people engaged in agrarian tasks. How do get there? Beats me. One of the reasons I found this essay by Berry so compelling is that he spelled out, I think quite thoughtfully, one form of privileging, one way of creating a particular space in the midst of industrial capitalism to allow the small farmers he knew and whose lives shaped the community he loved to be able to continue with their agrarian work mostly undisrupted by global economic transformations. It didn't last, but it was an act of resistance that succeeded for a while, and thus kept more people doing work that, one presumes, at least some of them really wanted to be able to keep doing, maybe even wanted to do for the agrarian reasons Berry defends. did the prairie farmers count on indefinite (if periodic) cash support from Washington to make their enterprises work? I mean, you've met Amish before, right? Old Order Mennonites? Hutterites? Kibbutizim? The Mormon fundamentalists? I thought we were discussing these ideas as they might be applied to all of society. I thought Berry was being prescriptive. Not just "some people do this" but even stronger than "everyone could do this" to "everyone ought to do this." It is, after all, a more moral way of life and counters the "unaccounted squandering of [our country's] actual, its natural and cultural, wealth." (p. 23, your citation) If, at the end, the message is "this sort of thing has worked well for some people and think about it a little" then fine. I'm not even terribly fussed about the extra accommodations the larger society would have to make for these islands of dissent; I think they're largely worked out in a pragmatic way already in Amish country, for example. I'm not sure there's a sound theoretical basis for saying "The rest of you should subsidize our efforts at autarky because reasons," but there are plenty of indefensible subsidies floating around, and as a practical matter others are larger and worse. I'm still skeptical of the tobacco planters. "We want to have an oligarchy that cements our social and economic status that was established by slave labor, and we want public funding to do it into the indefinite future." And even with heterodox communities, I'd probably cast a jaundiced eye from time to time. For every Shaker community or New Harmony or Oberlin, how many Koreshi compounds or Rajneeshi ashrams are established? What if Scientology had a back-to-the-land ethos but just as much ruthlessness? You know better than I about the exploitation that is reportedly rife in some fundamentalist Mormon settlements, and the lengths to which they have gone to keep away from the rest of civil society. To summarize, if your/Berry's claim is "Some people can live this way, and it works well for them," then I am basically fine with the notion. If the claim is "This is better for everybody, and everyone should/must do it," then no. "the combined decision of American business and America's government to get rid of as many farmers as possible, in the name of efficiency, is worth pondering"
These two things are obviously related. Correction of the "big=efficient=good" error need not involve any inorbitant privileging of small farming ventures, agrarian communities, etc. How about efforts towards establishing something of a level playing field? "Get big or get out" might not represent explicit government policy as much as it used to but it still seems to be an implicit assumption working beneath the surface of our farm policy. It seems to me that Berry and the other contemporary agrarians are asking that various political and economic roadblocks be removed so that people who want to farm small can do so without excessive government interference. Taking this into consideration, Unknown's statement of our/Berry's claim might be expanded to, "Some people can live this way, and it works well for them, and they ought to be able to do so without hindrance. And it is, in fact, 'better for everybody' that the folks who do want to live this way be free to do so," for all the various reasons previously mentioned. I could be wrong but that's the way I read the contemporary agrarian claim. The idea that "everyone should do it" is obviously inaccurate, but so is the implication that it primarily relates to "self-selecting groups of dissenters." That's sort of like saying that our only choices are between Wal*Mart and Amish farmers' markets. If you view small farming as a species of small business this error is avoided. But one of the problems is that we've tended to treat small farming rather more negatively than we've treated other small businesses, hence the need for some form of correction. Oh, is this all that we're talking about? No, it's not all we're talking about. You're not wrong in reading Berry's (and my) language as prescriptive; most forms of communitarian argument really do partake of broad moral and social criticisms of the liberal world, and Berry's certainly does. He really does think (and I am pretty sympathetic to his thoughts) that the agrarian way of life, even if just as a moral ideal, contains something valuable that we would be better off finding ways to prioritize at least a little more than we currently do (which, outside a few examples here and there around the world we could argue about, is basically "not at all"). No, the reason I brought up all those examples of communes and agrarian socialism is as part of one possible response to your incredulous "When has this ever existed?" Well, it's actually been tried a lot, and continues to be tried all over. Entirely successfully? Nope, never. Kind of like, once again, neither the preamble to the Declaration of Independence nor the Beatitudes in the Sermon on the Mount have ever been fully, successfuly incorporated into any community's way of life. But we don't, in response, say "Freedom of speech? Providing for the poor? Hey, if you're into that you strange wonderful little cult, knock yourself out." So why not say the same about agrarianism? Unless, of course, there are persuasive theoretical reasons not to ever employ it as an ideal, which are not, I think, the same as pointing out historical limitations or hypocritical applications of its practice. Isn't there a pretty large gap, at least in the philosophical literature, between the call that something should be done, and the command that it must be done? I know you've presented yourself as a resolute iconoclast/individualist/dissenter, Doug (though I think your important, committed service to your local school system suggests otherwise), but even so, do you really think that everybody, including poets and essayists and cranks like Berry, who go around telling people what they think they "should" do is committing some kind of offensive wrong? I'm just thinking about my experience on Prince Edward Island, where over the past century and a half there has been a mass abandonment of anything like an agrarian lifestyle. Migration, on a vast scale, was adopted by Islanders, first as a way to supplement incomes, then as an escape. New England factory work was overwhelmingly preferred as a mode of subsistence. These days on the Island, if there are populations interested in agricultural lifestyles, then they are substantially recent immigrants. Amish and Taiwanese Buddhists have moved to the province recently, seeking inexpensive agricultural land, perhaps following the precedents established by hippies in the 1960s. In my personal experience, the people on the Island who have praised an agricultural lifestyle, who have praised the agricultural lifestyle of old, have tended to be reactionary verging on racist. I'm reminded particularly of one of those old hippies, a man who has recently gained some local fame as an entertainer telling stories of the Island as it was, who was trying to create a fuss over the Buddhists. Berry's arguments do not seem particularly compelling to me. There are reasons why I, and others, have left; there are reasons why the people who stayed have urbanized, culturally and otherwise. Folk communities can be pretty terrible places, especially for people who theoretically have other options. My take on your final paragraph, Randy, is three-fold. As for your first sentence, well, de gustibus non disputandum est. I find his agrarian arguments quite compelling, for communitarian and egalitarian reasons, and I think those reasons can be defended, but obviously my reaction to him a function of whatever mix of assumptions and longings I carry around in my head; the long exchange I had here with Doug Merrill probably made that clear. For your second sentence, I have no dispute. I really don't think that I, in this post or the comments following it, have affirmed that the aim to protect and privilege agrarian ideals necessarily condemns those who are not moved by such ideals, and want something different--I might think that rural communities give rise to certain Jeffersonian virtues, but there are obviously other virtues as well, and the reasons which lead people (like me and you and Doug) to not want to live solely in accordance of agrarianism, and thus choose to leave agrarian environments or to urbanize them, is not therefore without virtue. Finally, I suppose I would just want to point out that "cosmopolitan communities," if there really are such things, can be pretty terrible as well, at least if all that I've observed and read about regarding alienation is true. But again, in the end, I think the freedom to choose one or the other is crucial...which means I really am just a liberal after all. The debate over rural living/agrarian values vs. urban living/cosmopolitan values has its place, although I think the urban side lacks some critical awareness of their own involvement in racism and exploitation. Further, the urban side comes close to suggesting, with Kevin Williamson, that many small towns and rural communities deserve to die. I am not going to try to talk anyone out of their dislike for rural living or farm work, but I would point out that, some voices here seem to assume that we can dispense with agriculture altogether. As if the choice Berry is proposing is to have agriculture, or have no agriculture. Rather, Berry's life work has been criticism of industrial agriculture. The criticisms directed at Berry's vision of an alternative agriculture also apply to industrial agriculture, which has not exactly eliminated racism and exploitation. Those who criticize Berry, then, also need to mount a defense of the current methods of industrial agriculture. When Russell wrote, "I think the freedom to choose one or the other is crucial" I should probably have just taken Yes for an answer and thanked him for his patience when I upbraided an author he clearly likes. But then I went and re-read the twelve southerners' "Statement of Principles," and nope, can't keep quiet about that one. The first thing to do is to complete the volume's title: I'll Take My Stand ... To Live and Die in Dixie. The land these men — and they are most decidedly only men — want to preserve is the pre-Civil Rights South, a region characterized by a racial caste system, enforced by law, by state violence and private terrorism. The authors are not in the least shy about opposing "a Southern way of life" against "what may be called the American way." They speak of a region with "its own kind of life" and "the Southern tradition." What is distinctive about this region, especially when it is counterpoised, as the authors have done, to the Union? Treason and rebellion, both to uphold chattel slavery, and after military loss the reimposition of racial hierarchy by organized violence. If this is the well that Berry is drawing on to defend his vision of a good life, it is a poisoned well, and nothing good can grow from its waters. Further, the authors say an agrarian life "does not stand in particular need of definition," which is about as fine a piece of handwaving that I have seen outside of a liars' contest. They count it the natural order of things, provided "superfluous industries are not allowed to rise against it." Who is doing the allowing? Who is deciding what is superfluous? Enough. The document shows readers what some immensely privileged men were thinking nearly a century ago; let it rest in the archives, of interest to specialists. "The first thing to do is to complete the volume's title: I'll Take My Stand..."
The title was chosen against the wishes of several of the major contributors. The other working title was Tracts Against Communism. Iirc, Tate, especially, felt that the book's arguments transcended the regional. "What is distinctive about this region, especially when it is counterpoised, as the authors have done, to the Union? Treason and rebellion, both to uphold chattel slavery, and after military loss the reimposition of racial hierarchy by organized violence." That's an extremely reductionistic and over-simplistic understanding of the thing. 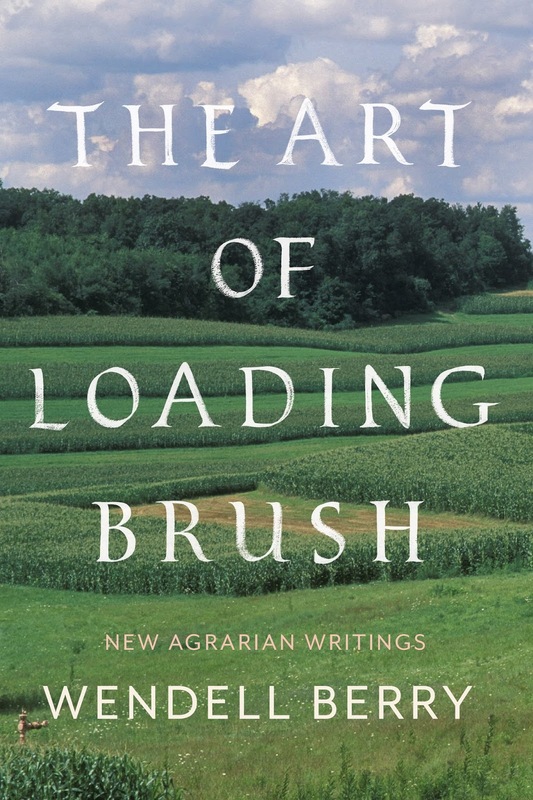 "Further, the authors say an agrarian life 'does not stand in particular need of definition'"
Probably quite accurate when the book was written. Now, not so much. "They count it the natural order of things"
Well, it sort of was, at least until the Industrial Revolution. "The document shows readers what some immensely privileged men were thinking nearly a century ago; let it rest in the archives, of interest to specialists." Just had its 75th anniversary printing in 2006, and has seldom been out of print in its nearly 90 year history. Someone obviously thinks it's worth reading (and it's not all Southrons and racists). Just two quick responses to Doug, since I've already acknowledged that my communitarianism/agrarianism/Luddism/anti-capitalism/Berry-fan-boyism/what-have-you clearly accepts certain liberal principles, like individual choice, as essential (if not sufficient) for the good life, and thus he can justifiably claim victory, and I don't want to take that away from him. 1) Reading Berry will make it clear--indeed, just reading the essay that my original post focused on will make it clear, that Berry is drawing upon far, far more than simply I'll Take My Stand. But yes, he was influenced by it. Touche for both 1) and 2) ! "The title was chosen against the wishes of several of the major contributors." I had not known that before; thank you for filling that gap. "That's an extremely reductionistic and over-simplistic understanding of the thing." Songs from '78: "King Tut"